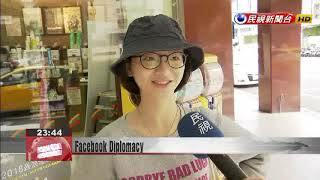 The Ministry of Foreign Affairs is leveraging social media to raise the profile of Taiwan. The ministry has encouraged Taiwan's representative offices to reach out to youth with posts on Twitter, Instagram, and Facebook. It's also carrying out a quiet rebranding of its Facebook presence, to put the spotlight on the word "Taiwan." Visit the Facebook pages of Taiwan’s overseas offices and you’ll notice something different. The profile pictures have been replaced with an image of Taiwan, and the page names have been updated to include the word “Taiwan.” It’s part of MOFA’s campaign to strengthen Taiwan’s image overseas via social media. It’s clearer this way. It is apparent that they want to use the name Taiwan. It might have some effect in terms of promoting Taiwan’s image. Since the country itself is not called Taiwan, why force the name? I feel it’s better to use Republic of China. Taiwan has over 100 representative offices around the world, and 54 of them have a Facebook presence. So far, nearly 30 of them have gone through the rebranding. In another recent campaign to raise Taiwan’s profile, MOFA took out ads on trams in Poland, where the U.N.’s climate change conference is being held. Whether they are locals or visitors from an embassy, if they pass by those trams in Poland, we can convey to them that Taiwan is a key player in the international community. Our hope is that they won’t forget about Taiwan. Facing tough challenges from China, Tsai Ing-wen’s administration has adopted a creative and varied approach to bringing “Taiwan” out into the world.